Changing a light fitting is the sort of job that a novice DIYer would expect to be very easy, but it actually often isn't. The novice DIYer might expect to see three wires - live, neutral and earth. But most of the time they will see a whole lot more wires than that. With most light fittings, the ceiling rose doubles as a junction box, so you have one cable coming into the rose from the previous light in the circuit; then a cable going down to the switch and back; and then a third cable running off to the next light fitting. We always ask handyman candidates to describe the wiring they would expect to see inside a ceiling rose - if they answer correctly straightaway, that gives us a pretty good idea that they understand how lighting circuits, and domestic electrical circuits in general are set up. 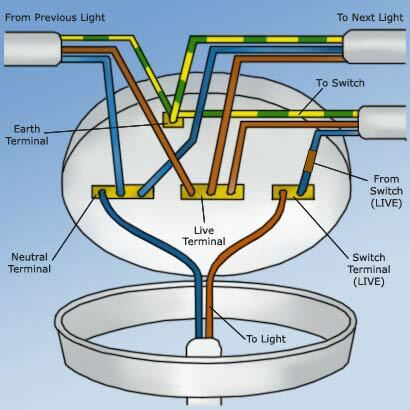 There is a good picture here of how a typical light fitting is wired. Need any odd jobs doing? Visit www.0800handyman.co.uk. Very clear 'idiot's guide' - even I could understand it. Thanks, Bruce. Just opended a ceiling rose to fit a new light fitting and found FIVE sets of wires. Of these two were neutral and earth only. I'm guessing this rose has been used to connect to the outside light. Problem is there is not physically enough room to fit all the wire ends into the lights connection block! Any suggestions? This explains exactly why I've been confused with light fittings. It now makes perfect sense why the light in my bedroom wouldn't work when I badly fitted a new light in my landing.